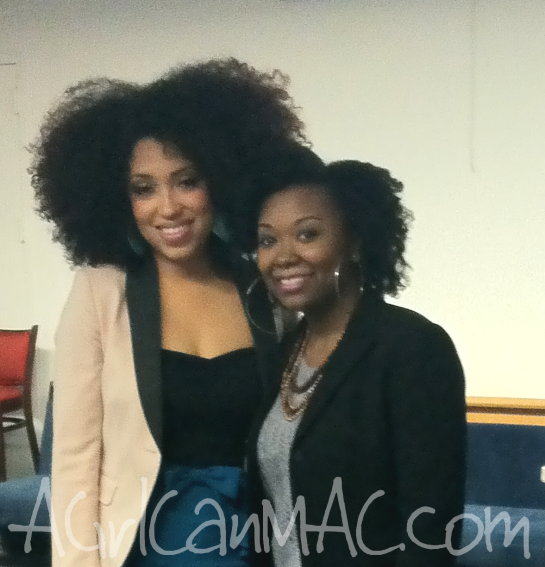 I was very humbled when AGrlCanMAC was invited to interview Taren Guy and attend her second Luv & Learn Your Hair event last Friday night at the Harlem Arts Center. Some of the top sponsors were Hair Rules and Vitacoco and they supplied free samples. With about 600 were in attendance, there was no shortage of great energy, beautiful people and of course, great hair. The event included food, accessory and beauty vendors, a panel discussion, live hair styling demos from the Hair Rules team and live entertainment. Kings Rule Together was one of the vendors there and I'm so mad I didn't make it back there to get a shirt! Guess I'll purchase on the web instead. The food vendor for the evening was She Caters and I swear there was crack seasoning in that macaroni and cheese. It was nothing short of yorgasmic ( a word I created that combines yummy + orgasmic) and if they were taking cards, I would have ordered some more to take home with me. Their fish tacos were delicious as well. In our interview, prior to the event going underway, Taren explained the meaning and mission behind the Luv & Learn Your Hair event, how it felt doing this event for the second time and details on how she was rocking her hair for the night. I am having trouble getting my interview up here. I apologize for this and promise to figure it out and get it up here as soon as possible. The panel discussion, titled "The Deeper the Roots", was so involved that they actually went over the scheduled time for it. It was made up of Anthony Dickey of Hair Rules, Michaela Angela Davis, Nakesha of Himayn10ence and three randomly selected attendees. Everyone had insightful opinions. Dickey and Tameka kept us all laughing and Micheala spoke with a lot of passion. 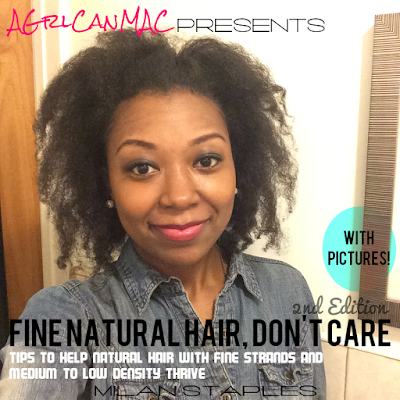 Some of the topics covered were "do looser curl naturals have it easier", reactions to our hair and natural hair in the workplace. At the end of the evening Taren made the big announcement that Luv & Learn Your Hair was going on tour across the country and internationally. What an exciting endeavor. She confessed this to me first in our interview before the event started. I'm so mad, in haste that morning, I left my camera at home so I had to make it do what it do with my trusty iPhone so all pics were via that, please don't judge- I'll do better next time. LOL. 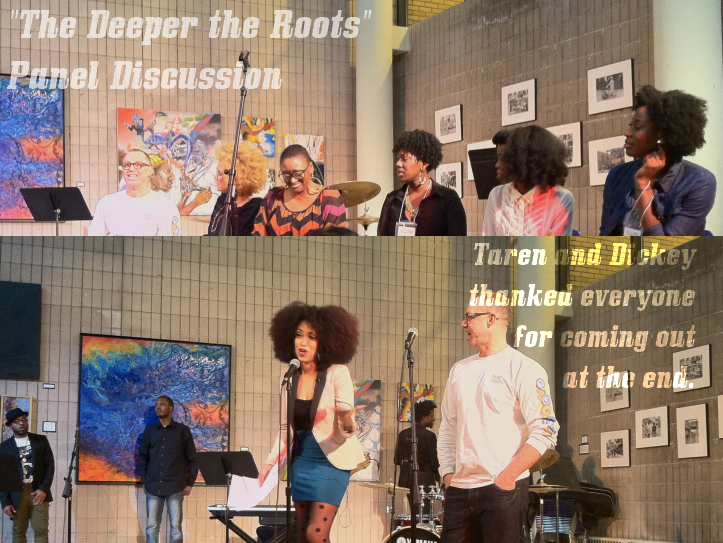 Check out the brief interview I had with Taren. I got to meet some new faces and saw many familiar faces as well as some of my friends in my head from Instagram. It's apparent that Marley twists, yarn twists and Havana twists are trending big time. I saw them, more than braids, everywhere and they looked so great on everyone, now I'm thinking about doing some on myself in the near future. You can see pictures of who I was hobnobbing with on the Instagram page and also under the hashtag, #llyourhair, on Instagram to see what pictures everyone else who was there captured. Many thanks again for inviting AGrlCanMAC to be a part of this wonderful event and I send much love and success to Taren and everyone who was in the building.